Traces of a Tempest Passed - Website of mejstanley! 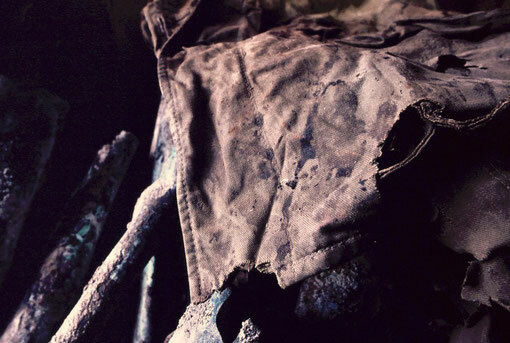 SINCE ARRIVING in Japan in 1979, I have visited a number of Pacific War battlefields, and have worked to convey the eerie, heavy melancholia that haunts them. I have also come upon some iconic -- sometimes untouched, sometimes preserved, sometimes reconstructed -- relics of that conflict in other, often unexpected, places. 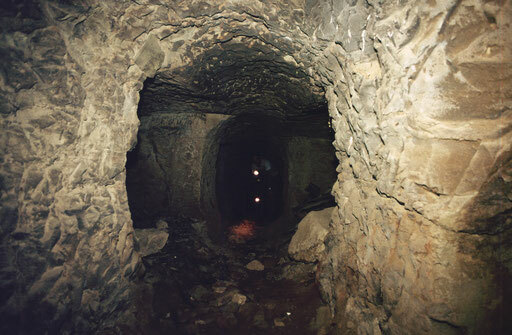 The photographs here portray a variety of both. I have met and spoken with veterans of that war from both sides. Their input has in many cases given deeper meanings to the images I have made. Among those veterans was my own father, who was a Marine in the Second World War and participated in the battle for the island of Peleliu in the Palau Islands. Among the battlefield islands I have photographed are Saipan, Guam, Iwo Jima, Okinawa, and of course the Palaus -- Peleliu in particular. I shall be scanning and adding further images here, and I hope to continue my travels in the region so as to expand the scope of the image collection. 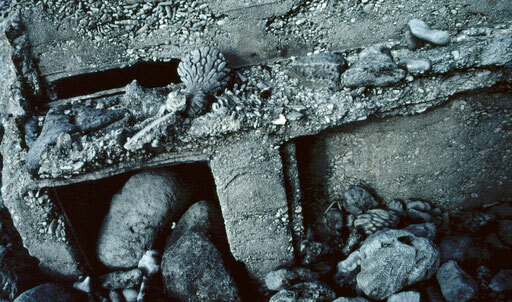 It is my hope that the images in this gallery may inspire a bit of curiosity about the savage war that swept across the Pacific and put the lie to the meaning of that ocean's name almost three-quarters of a century ago. 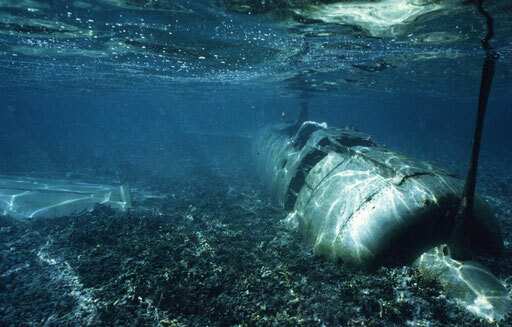 Sunken A6M Zero fighter off Ngurkthapel Island, Palau. 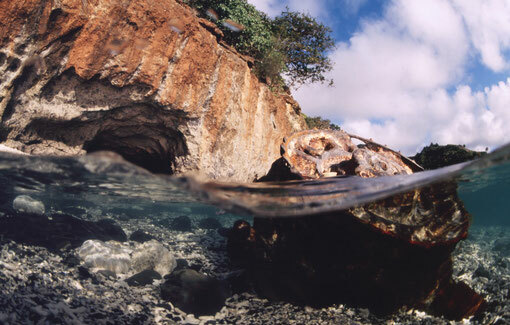 Local tradition relates that the pilot survived the crash landing and managed to wade across the reef flat to the island. 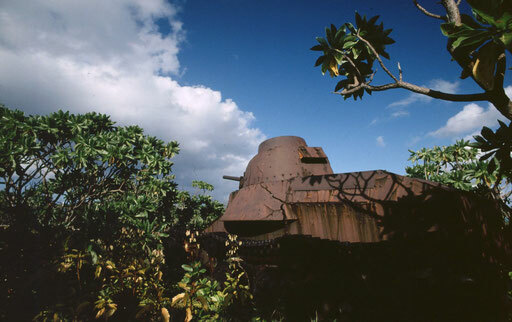 Japanese tankette rusting in the bushes, Marcus Island, Japan. While the island was attacked from the air, it was never assaulted directly; this tank never fired a shot in anger. 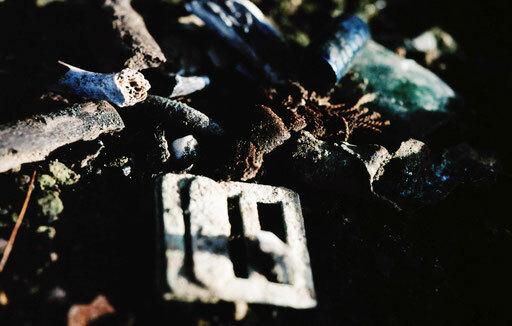 Recent memorials are placed alongside remnants of the fighting at a cave entrance, Iwo Jima. The sides and ceiling still show charring from a US Marine flamethrower assault. 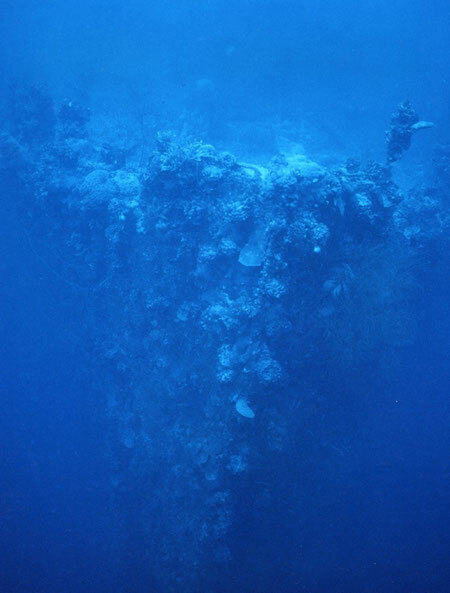 The coral-encrusted bow of a sunken munitions vessel settled nearly upright on the bottom in 40 meters of water; Palau. Inside a cave system, Iwo Jima, Japan. 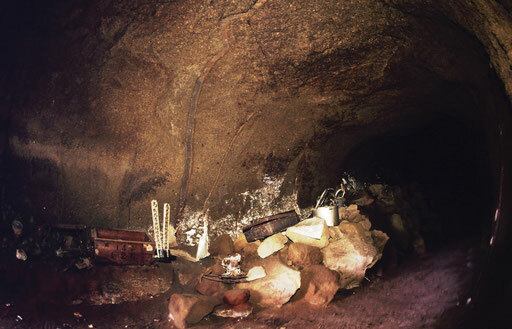 The Japanese government is working to repatriate remains of the war dead, but this cave was still untouched when it was photographed. It had apparently lain undisturbed since the end of the battle in 1945. Details of a restored-to-flying-condition Lockheed P-38, a WW II US Army Air Forces' fighter used to great effect in the Pacific War. 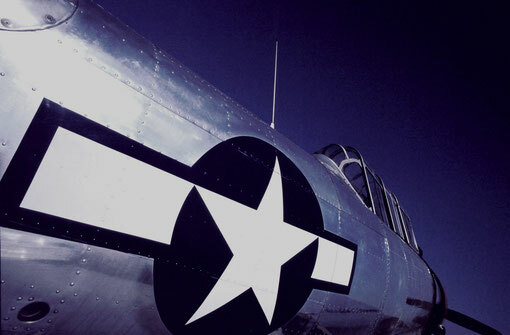 The USAAF's highest-scoring ace, Richard Bong, flew this type. A shoreline-defense pillbox, partially sunken into the sand and coral rubble just inland from the water's edge; Marcus Island, Japan. 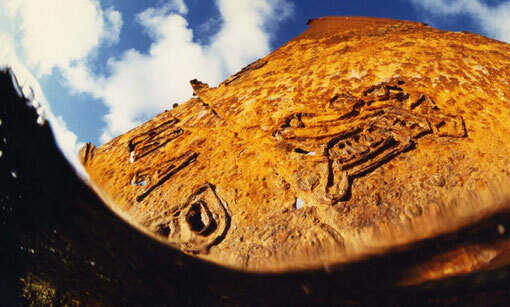 A detail of the rusted steel armor of a Japanese tank, Peleliu. 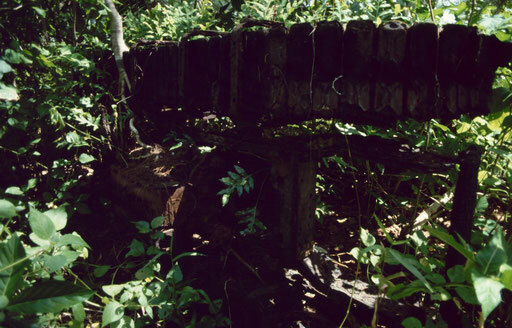 A Japanese E13A floatplane engine, Palau. 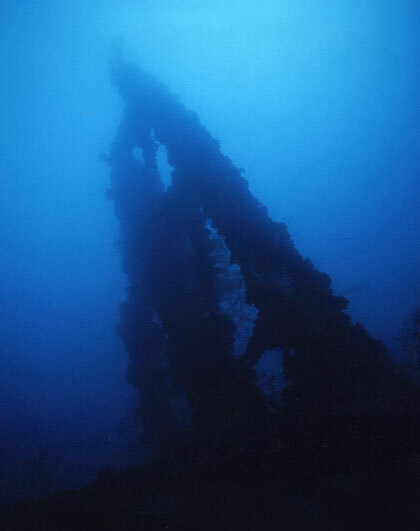 The mast of the freighter Iro, Palau. 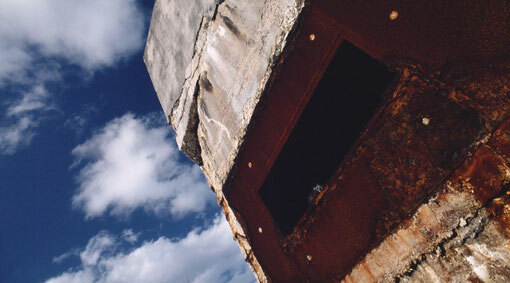 An exterior view of a Japanese pillbox weapon port, Marcus Island, Japan. 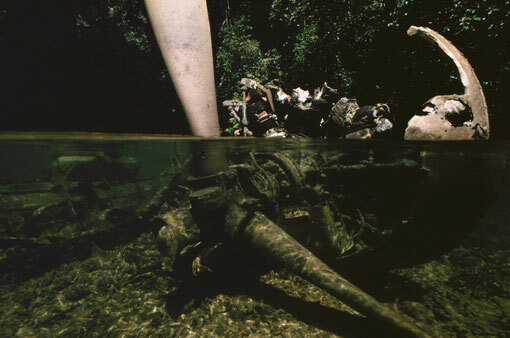 A strafed E13A Japanese floatplane rests on the bottom of the concealed inlet where it was unsuccessfully hidden, Airai, Palau. 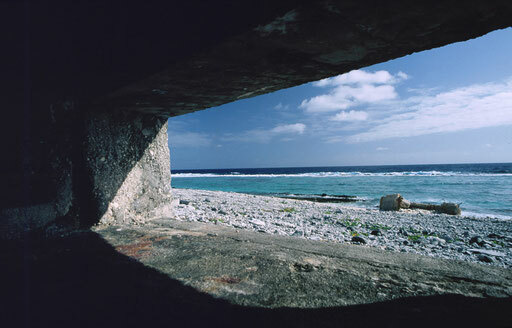 A pillbox's gunport view across the lagoon and coral reef beyond; Marcus Island, Japan. 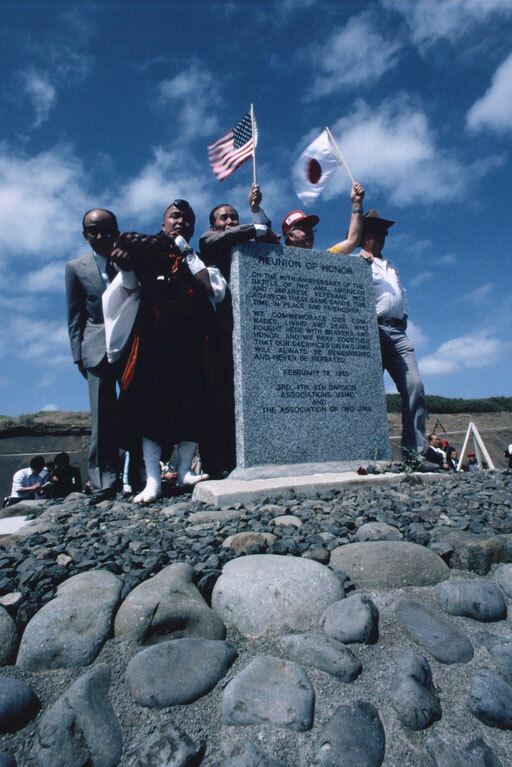 Veterans from both sides, the son of Baron Nishi Takeichi (at left, wearing a suit), and a Buddhist priest at a memorial dedication, 1985: Iwo Jima, Japan. Baron Nishi won an equestrian gold medal at the 1932 Olympics; he died in the battle here in 1945. 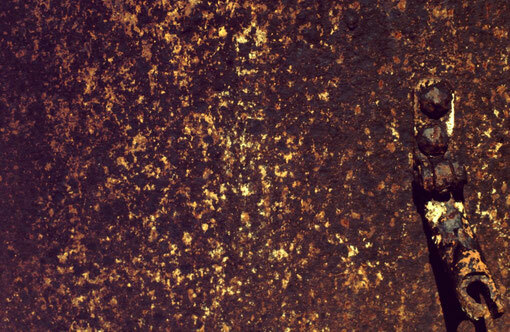 Bloodstains on a Japanese Army rucksack; at a cave-entrance memorial, Iwo Jima, Japan. 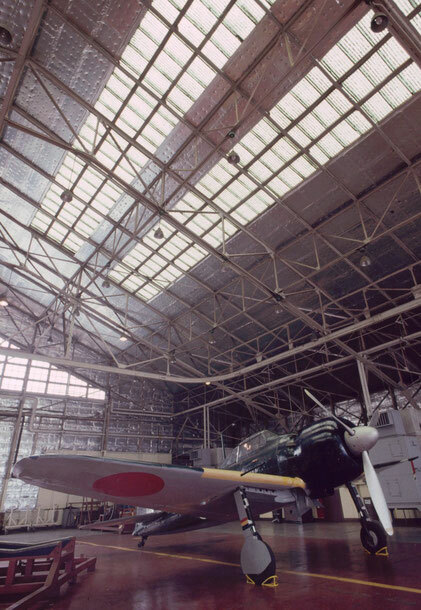 A restored Mitsubishi A6M5 Zero fighter, Tokyo, Japan. 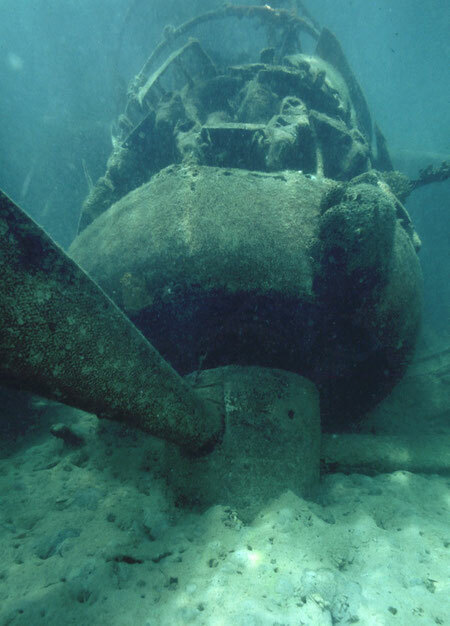 Engine of a downed US Navy F6F fighter in the shallows off Chichijima, Japan. 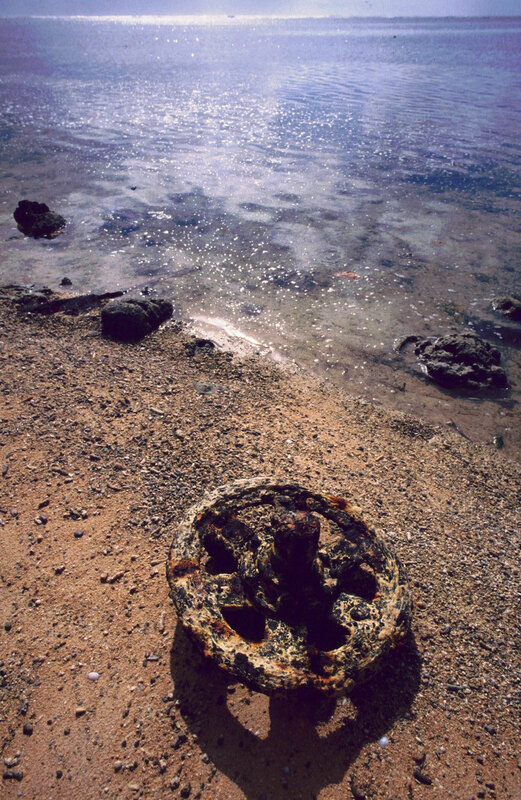 Part of a US Marine amphibious tractor juts above the rust-stained coral sand of Peleliu's beach. Supported by four mini-tanks, Japanese infantry struck back at the invading Marines on Peleliu. This tank remains where it was hit. 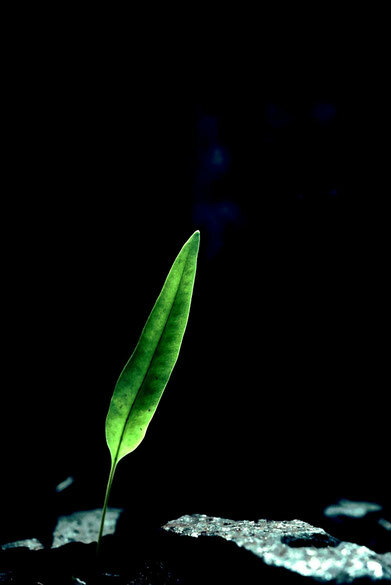 Rooted in the steel folds of a knocked-out Japanese tank's treads, a fern leaf probes the sunlight. 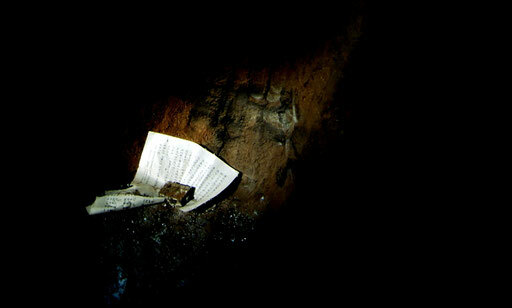 A shaft of sunlight illuminates a Buddhist prayer left in memory of fallen Japanese soldiers at the entrance to an Iwo Jima cave. 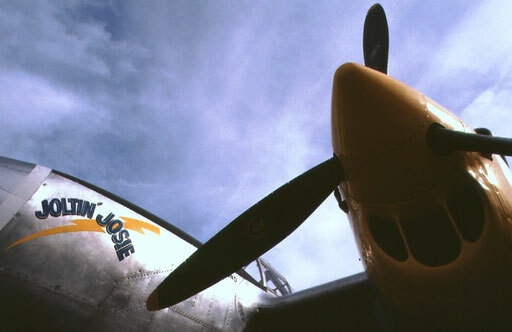 The USAAF insignia on a WW II-era AT-6 trainer, restored to its original finish. 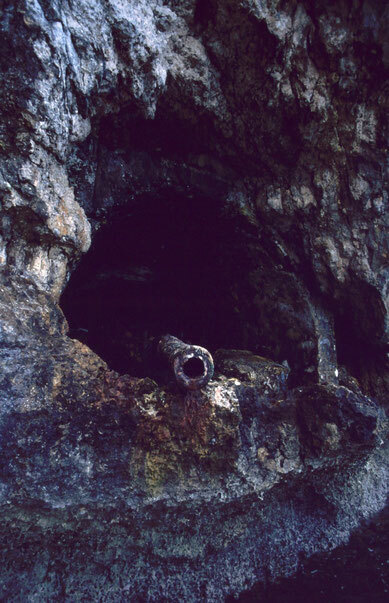 A Japanese defensive coastal gun, its rusted barrel peering from a sea-level cave in Palau. 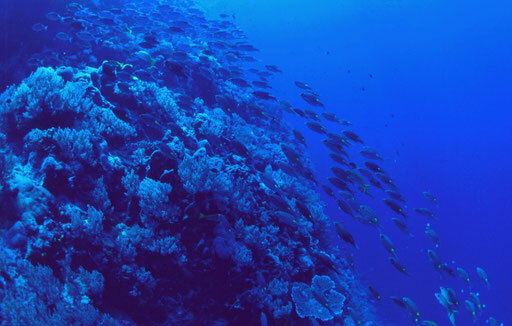 It was one of many intended to protect the city of Koror and its harbor complex. 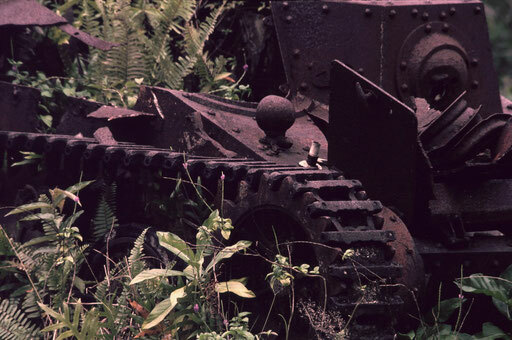 Another of the four Japanese tanks knocked out by US Marines on Peleliu as they blunted the aggressive Japanese counterattack. 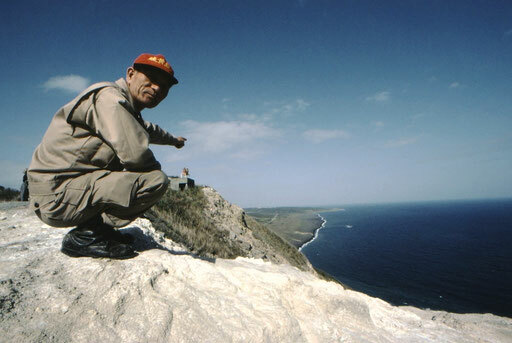 As the battle raged above the sea's surface, amphibious tractors and landing craft of the Marines passed over this submarine cliff on their approach to Peleliu's assault beaches.